“Mr Murdoch, you must be the first mafia boss in history who did not know he was running a criminal enterprise,” so said Tom Watson to James Murdoch of News International at the Parliamentary Select Committee hearing last November. At the time not everybody approved. Alexander Chancellor in the Guardian was quite sniffy. He described the remark as silly and concluded that James Murdoch was safe. Tom Watson had been unable to resist playing to the gallery and had failed to master the forensic talents of skilled interrogators. These are my words not those of Chancellor but they summarise what his critics said. Not surprisingly, Sky News was not quite as concerned about the adversarial skills of Watson. They were more interested in the spiritual redemption father Rupert had experienced in the back of his limousine on his way to the hearing. Rupert Murdoch, the man who prefers to think of days as being humble rather than himself. If the Tom Watson wisecrack was not to the taste of everyone at least it was grammatically accurate. God knows who taught Rupert Murdoch how to use English grammar. Perhaps he lost his grammatical grip while managing his empire. ‘It was the Sun wot done it,’ may be a half decent excuse. Well, James Murdoch was not safe and News International is now rocking and will rock a little more after this week and the publication of the Tom Watson and Martin Hickman book ‘Dial M for Murdoch.’ The book reveals that members of the Parliamentary Select Committee were put under surveillance by a ‘crack’ squad of News International reporters. The objective was to find secrets about the committee members. At the London Book Fair this week, Watson made clear to all those who listened that his lawyers had read the book and insisted on corroborative evidence. To use the tortured language of Murdoch, ‘Dial M for Murdoch’ had more than one corroborative day. So we can believe the story is true, just as we can accept the allegations about the once Director Of Public Prosecutions, Ken McDonald, being wined and dined by News International editors and Chief Executives. And if dirt had been found then threats would have followed. ‘Fix the jury and buy the judge? We’ll do our best, Mr Capone.’ True, there is no evidence that either the Select Committee or the Director of Public Prosecutions responded to the behaviour of News International but all this proves is that Capone had superior influencing skills. Whatever the Foster adverts might say, Australian villains are no match for authentic Chicago gangsters. 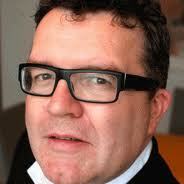 Watson has predicted that his book ‘Dial M for Murdoch’ will be the most attacked book this year. Trevor Kavanagh at the Sun is already leading the way but it would take a better man than me to summarise the opinions of that particular hysteric. His journalistic style consists of disconnected slurs and random resentments that avoid argument and defy logic. Somewhere in his prose, though, he mentions that Watson is an intolerant bully and, worst of all sins, is even a socialist. When Tom Watson was interviewed by Jonathan Heawood of English Pen last Monday the response of the audience at the London Book Fair was far more appreciative. 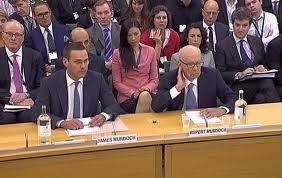 Many of those listening dwelled on more serious matters such as how close Murdoch had come to owning all of BSkyB and controlling rather than dominating the British media, and how members of the Government were determined to help Murdoch undermine what are the pathetic remains of British democracy. The catastrophe was averted in the same way Kevin Costner sorted Robert De Niro in ‘The Untouchables’ or Alan Ladd blasted Jack Palance in ‘Shane’. For once, the good guys won and it was impressive how Tom Watson at the London Book Fair resisted praise and glory. The Kavanagh caricature was not present. Indeed, Watson several times stressed the contribution and importance of others. The work done by Martin Hickman on the book ‘Dial M for Murdoch’, and the moment when Ed Milliband decided he would fight elections without the support of Murdoch. We will all have a view as to what constituted the McCarthy moments that punctuated the sordid saga of News International but only lost self-centred souls would deny Tom Watson praise and respect. He made a difference and that is the best epitaph there is. I was older than many of the audience on Monday. I can remember the Murdoch version of the Sun being launched in Britain. Prior to this there had been tabloids but not tabloid culture. Newspapers reported the news and news meant politics. Newspapers had something else besides dirt and gossip. But once Murdoch outlawed serious news from his papers he drove arrogantly into his own cul de sac. Of course, he always intended to finish in a cul de sac but what he envisaged consisted of a dumbed down population that would mindlessly vote for the powerful simply because they were supposed to be glamorous. He missed the second dead end, that with nothing to write about but dirt and gossip he was obliged to dig deeper and deeper into personal lives. The empire of Murdoch did not go into decline or lose its way. The mistakes Murdoch made were inevitable and the seeds were sown forty years ago. The dirty tricks were the consequence of the trashy tabloid culture that Murdoch created. The elite of Britain should have treated the bad taste of Murdoch with contempt. Instead, they embraced it like the corrupt policemen you see in a cheap Hollywood ‘B’ movie. Make no mistake, this scandal will run and run. Our elite is shabbier than ever. When Watson resigned his post as Government Minister he was condemned by Tony Blair for being disloyal. Tom Watson had had the temerity to state the obvious, to remind Blair that his leadership was the reason long standing Labour voters were abandoning the Labour Party. The avarice and war mongering of Blair had gone out of style. Some have claimed that Watson was a puppet of Gordon Brown but after the performance I witnessed at the Book Fair I think we should give him the benefit of the doubt. Nobody else, in quite the way Watson did, challenged the most repulsive leader the Labour Party has ever had or stood up to Murdoch. Let us give credit when it is due. And, of course, Tom Watson is a suitable topic for an Elvis Presley Challenge, more suitable than most as it happens. He is not only an Elvis fan and has a potentially great rockabilly hairstyle but he has the same birthday as the supreme rock and roller. We all know the scene in ‘King Creole’ where bar sweep Danny Fisher stands up to the gangster bully Walter Matthau. As Elvis sang in this great movie and later resurrected brilliantly in his ’68 TV special, ‘if you’re looking for trouble you came to the right place.’ Last Monday, we listened to Tom Watson describe how resistance eventually led to the Leveson enquiry into a corrupt press. The London Book Fair felt like the right place to be. Enjoy the clips. This is a superb piece which achieves just the right balance on all the relevant issues, whilst still retaining Howard’s unique approach and dry humour.